Step by Step Salat is a mobile app that will guide you about how to pray in Islam. Using step by step Salat will help you fulfill the obligation of Islamic prayer. 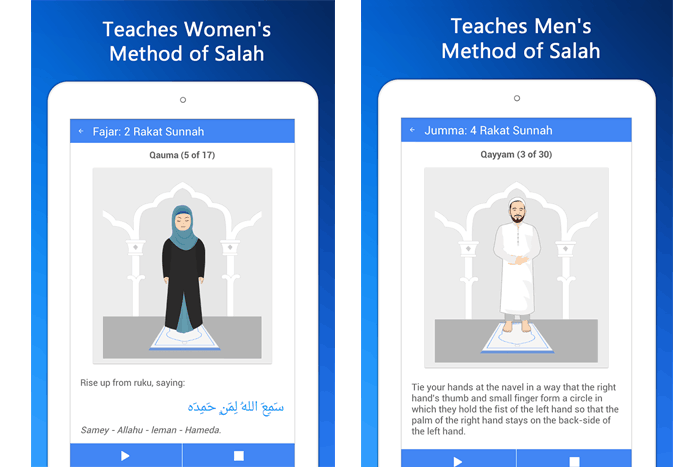 Each step of Salat is described in this smartphone app in form of pictures with elaborated description. Along with the categorical description of steps, the recitation required at each step is also provided in Step by Step Salat.Moreover, translation, transliteration and audio for each step of prayer are also provided in this app. This is a free app provided by QuranReading.com available to be downloaded from the following platforms. Salat is a fundamental pillar of Islam which brings you closer to Allah. The importance of Salat is highlighted multiple times in Quran. It is mandatory for every Muslim to start praying 5 times a day starting from the age of seven. As much as Salat is important, it is also important that each step of Salat is performed with complete precision. As a kid, every Muslim is taught to follow the steps of Salat as performed by his elders. Sometimes, people don’t have the right person to guide them about how to perform Salat due to factors such as they are new to Islam, or they have forgotten how to pray and are ashamed to ask from someone. While many apps require you to pay, the Step by Step Salaat is a gift from the publisher. It is free to use. The correct number of Rakaats to be prayed for each Namaaz. Timely offering of Salat with the Salat Alerts thus increasing the reward from Allah. 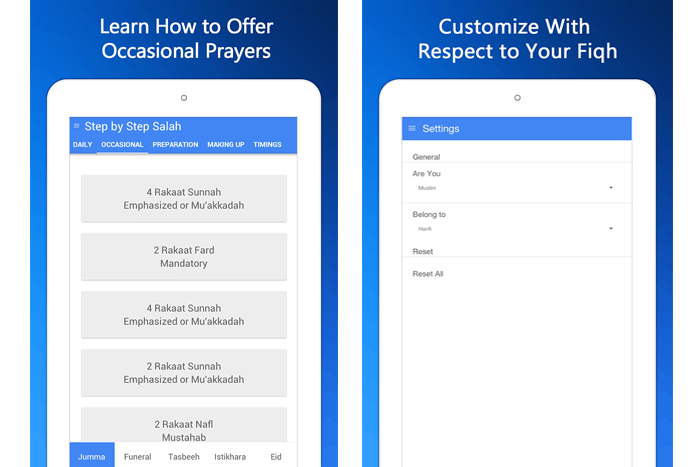 Step by Step Salat app has several features that will help you in praying correctly. Pictorial Representation of Salat Steps: Images of a man performing the steps of Salat are included in step by step Salat. These images represent each step very clearly. Description: Each step of Salat is described with its name. The description enhances the ability to understand the step. What to Recite: with description of each step, what to recite during performing the step is provided in Arabic. Translation: The translation of each Salat step is given in English for better understanding during the prayer. Transliteration: Transliteration of the Arabic steps is provided in English for people who can’t read Arabic properly. Audio: Audio is also available for the recitation of each step in Salat. 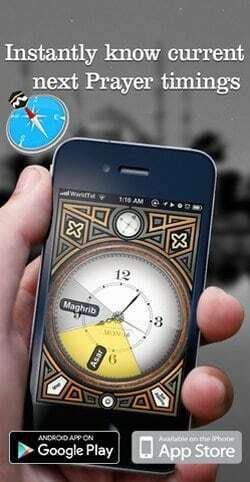 Salat Times: Along with the method of Salat, this app also carries the Salat timings of any location in the world. Alerts: Alarm can be set to remind you of Salat time in your area. 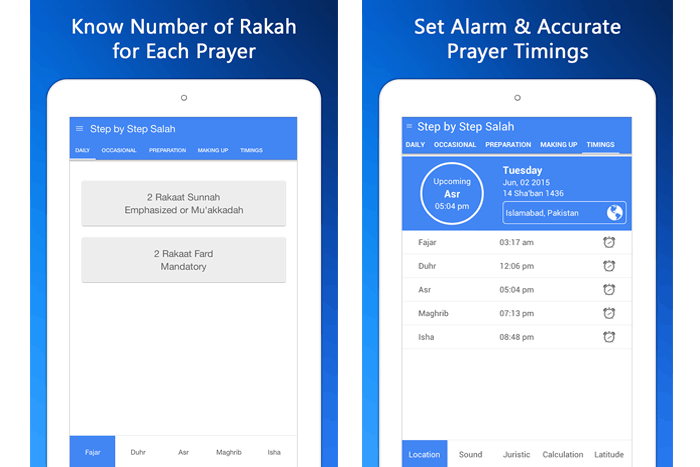 Salat Table: A table is included in this app which illustrates how many rakats of Fardh, Sunnat and Wajib have to be performed for every Salat. Step by Step Salat is a very beneficial app for both kids and adults. You can use this app to teach your young children how to perform Salat. Also if you are new to Islam and looking for a guide to Salat, this help has great benefits for you. Install this app to correct your way of performing Salat and maximize the effect of your ibadat. Also, look into the list of our more Islamic apps for you to download and use free of cost.